Two tragedies have made me think long and hard about the problem of human suffering this month. I experienced one first-hand; I only read about the other. Let me tell you first about the tragedy I read about. The current issue of the New Yorker magazine has a story by the father of a nine-month old girl who had a very rare kind of brain tumour. The writer, an acclaimed novelist, describes the child's illness and death—and the effect on her family—in words that broke my heart. But pain wasn't the only emotion in the article. There was, it seemed to me, a repressed anger towards God. Here's what the author said: "[W]e stayed away from anyone who we feared might offer us the solace of that supreme platitude: God. The hospital chaplain was prohibited from coming anywhere near us." After little Isabel died, her father takes his non-belief to a sharp conclusion. He wrote "One of the most despicable fallacies is that suffering is ennobling—that it is a step on the path to some kind of enlightenment or salvation. Isabel's suffering and death did nothing for her, or us, or the world. .."
"And Isabel most certainly did not earn ascension to a better place, as there was no better place for her than at home with her family." Our local tragedy is already familiar to many of you: the sudden death of Patty Delesalle less than a year after the loss of her daughter Murphy. After Patty's death, a number of parishioners asked me to help them to deal with their confused feelings. One person put it bluntly, telling me she is angry with God because He has been so cruel to this family. At the funeral Mass, I said straight-out that I did not have a neatly packaged answer to the questions posed by these awful events. I tried my best to honour the confusion and hurt of the congregation, recognizing that a funeral may not be the best time to wrestle with issues so complex that even great minds have problems dealing with them. But I knew I would need to tackle some of them sooner rather than later—partly for my own sake, but partly for yours. As Father Benedict Groeschel writes in his book called Tears of God and subtitled Persevering in the Face of Great Sorrow or Catastrophe, "We all have sorrow, but we don't all have the horrible in our lives. But it does come. It comes to people we know, and maybe some day it will come to us, and we will have to be prepared." And I need to say more than I could say at Patty's funeral, where many of those attending were not of our faith or perhaps of any faith. I need to present to you at least the outline of the Christian answer to the question "How can a good God let bad things happen?" In other words, if God really loved us, would He not shield us from the worst of tragedies, or even from all tragedies? What I say today would bring no comfort to the poor father of that poor child, because I begin with an assumption he cannot accept—namely that God is real and not a platitude, and that there is a better place than here. But even without belief in God, I cannot agree with what he says about the uselessness of suffering. One of the conclusions of Father Benedict's book "is that we grow when we experience catastrophe by becoming more sympathetic and concerned about other people." I don't think it was a coincidence that one of the most heartfelt expressions of sympathy I received after my father's death was from a member of the Delesalle family. But the difference between us and the New Yorker writer is that we're still looking for answers. So let's see what the Word of God and the wisdom of the ages can offer. 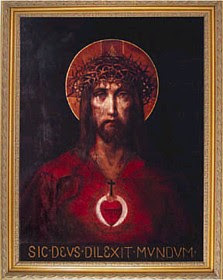 The only place to start, today at least, is with the words of Jesus we just heard in this morning's Gospel: "God so loved the world that he gave his only-begotten Son, so that everyone who believes in him may not perish but may have eternal life." Father Benedict says that once we've lived through the immediate period of grief and disorientation after a catastrophe—once we've had some time to pick up the pieces—there's only one thing to do. At this point, he writes, "people of faith must embrace their belief in God. There's no way around this." You can look for an answer to the problem of pain without looking for God. Philosophers were doing that long before Christ. But you can't call God on the carpet without letting him explain a few things in his own way. Both the New and Old Testaments describe God's love and concern; the Catechism says that "the witness of Scripture is unanimous that the solicitude of divine providence is concrete and immediate; God cares for all, from the least things to the great events of the world and its history." But… and here's a big "but"—this does not mean that God is the author of our misfortunes, willing evil so that he can rush in and help out. He does not treat anyone "cruelly" or take away children from their parents. When we speak of divine providence, we mean our belief that God can bring a good from the consequences of an evil. We don't mean that evils aren't evil; they are. But God permits them and uses them for his sovereign purposes—which are not, and I can't stress this enough—always clear to us. We don't always see what God is accomplishing in us and for us at times of great sorrow or suffering. One of the reasons for that, of course, is that he may be accomplishing our salvation, something we won't understand until we meet him face to face. Other times we can actually see his footprints, and recognize the good that came from something we could not accept or understand when it happened. In either case—whether we can see God at work or not—we must cling to—maybe even memorize—these words of St. Paul to the Romans: "We know that in everything God works for good for those who love him" [Rom 8:28] This is not an "answer"—it's a promise. There's a line in the Catechism so important that it's printed in italics. It's not an answer either, but it tells us where to look for one. Here's the sentence: There is not a single aspect of the Christian message that is not in part an answer to the question of evil [CCC 309]. Today we celebrate the central mystery of the Christian faith, the belief in the Holy Trinity. This doctrine stands before us as the perfect example that there are truths—essential ones—that we can trust without fully understanding, that we can accept without fully grasping. So too with suffering. We want a simple answer to a complex question, but what God offers us instead is a mystery—a journey into our hearts, and into his heart. We want to understand him, but he wants us to love him first.